Do You Know the Muffin Pan? : My boyfriend makes muffin pan food too! So last night my boyfriend and I went over some friends house for a crab dinner. Hold on, let me back up. First of all, BEFORE dinner, I was at work. My second day. And it was AWFUL! I'm sure I'm exaggerating but I felt like a complete mess. My job entails picking students up, hanging out at The Braille Institute and dropping them off at their homes after their activities. A job consisting of mostly driving for a person directionally challenged like myself is just plain wrong. Anyways, I was dropping 2 students off at their respective homes, both places I have never been before. So I plugged the first address into my trusty iphone... bee bo beebo beep... and off we went. Drive. Drive. Drive. Drop off. Second child, plug in address...bee bo beebo beep. Drive. Drive. Drive. Answer questions. Drive. Drive. Drive. Answer more questions. Drive. Drive. Ask important question. Stop. Check Address. Plug in new address... bee bo blah...Turn Around. Check dying phone. Drive. Drive. Drive. Drive. Drive. Drop off. Any guesses as to what question I asked....? Me: You live in Santee correct? LittleMissQuestionPants: No. I live in Lemon Grove. Are we lost? Me: No *looks down at dead battery on her phone* we'll be fine. LittleMissQuestionPants: Are you sure? Now I'm getting nervous. "What color do you think oil is under a microscope?" "Do planes and cars use the same kind of gas?" "Do you believe people are put here for good or are all people just bad?" "How many gallons of gas do we get from one dinosaur?" "What is the Industrial Revolution?" "Wouldn't it have been better if there wasn't the big oil spill?" "Don't you think everything would be better if we just had world peace?" "Can we keep talking now?" That last successful phone call was to my boyfriend saying "SCREW DINNER AT SHAUN AND BETTY'S! I'm going home to cry." Well needless to say I didn't do that. I sucked it up, mostly because I wanted a hug. When I got there my boyfriend was just finishing up preparing dinner. He was SO proud to show it to me. He said "Look honey, it's made in a muffin pan!" 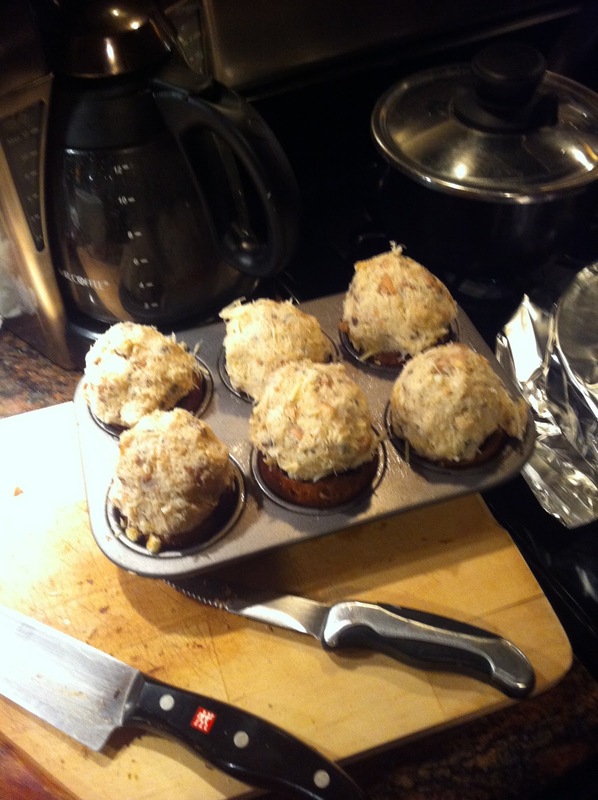 Those are Crab Stuffed Mushrooms. There is exactly 66% percent of crab in each of those GIANT mounds. Also in there is the entire contents of our friend's fridge... all balancing on top of a wee little mushroom top. But hey, they are made in a muffin pan! Alright, I gatta give my man some credit. They looked ABSURD but they tasted AMAZING! Crabby, mushroomy, cheesy goodness. *tear* My first muffin pan prodigy. It was the perfect ending for my horrible day. Crab for the crab! That's so sweet of your boyfriend! I'm glad your day ended on a good note. Hey, they look pretty good to me! You live in La Mesa?? I'm in San Diego too. What's up w/ the Disney passes? What's your connection? I just started my blog less than 2 months ago so I'm quite new. But it's way fun, I love looking at food blogs so I thought it'd be fun to share my favorite recipes with others. 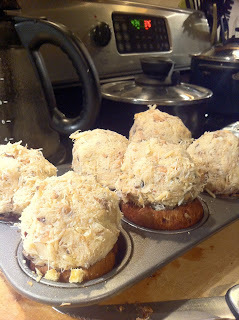 This blog is a cute idea, I think there are so many fun ideas of recipes to make in a muffin pan. JENNY IS THE BEST!! Thanks Becky! They were AMAZING, Lori. 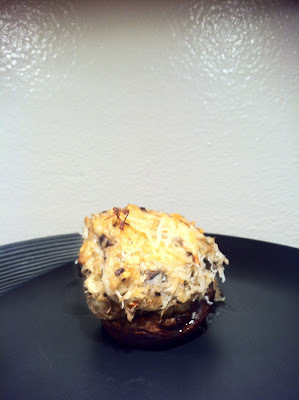 My boyfriend has always made the best crab stuffed mushrooms. These are more like crab ball TOPPED mushrooms. But yummy yummy yummy nonetheless.